Weddings, parties, and corporate gatherings — no matter what type of event you will host, you can always make it better with the help of Cigar Stud Events. Our cigar roller in Fort Lauderdale turns regular events into upscale occasions. Cigar Stud Events knows a way to make celebrations and social gatherings more interesting — cigars open the door to relaxation and better conversation. We are on a mission to provide a one-of-a-kind experience that sets your event apart from the rest. 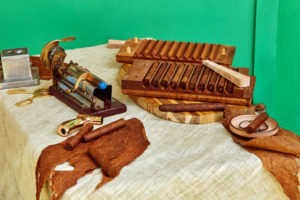 Our cigar rollers in Fort Lauderdale will allow your guests to indulge in perfectly hand-rolled premium cigars. When you book our cigar rolling services, expect nothing less than the best. Our youthful and energetic staff is capable of interacting with any type of audience — age, race, gender, and background do not dictate what we do and who we talk to. You can simply let loose and enjoy the exquisite taste of each cigar that our staff will assist in cutting and lighting. If you book our cigar rolling service, you may choose from 50, 75, or 100 cigars hand-rolled on-site by a master cigar roller. We even provide complimentary cedar spills and matchboxes so that you don’t have to worry about the paraphernalia. In addition to cigar rolling services, we offer high-quality hookah services for parties, weddings, and corporate events in Fort Lauderdale. Just let us know how many guests you are expecting and we will set up a full-service hookah experience for you. With the help of our cigar roller in Fort Lauderdale, you can turn your ideal party into a reality. Our team pays close attention to detail and handles every event with utmost professionalism. You can expect us to provide a one-of-a-kind cigar experience. Cigar Stud Events wants your Fort Lauderdale event to be memorable. So, we always strive for great customer service. Our team is always on time and attentive to whatever needs you or your guests may have. Book our cigar rolling services now. Request a free custom quote, today.